Search Results for "boxing boy"
Boy teenager waving their fists at the lawn in the forest. 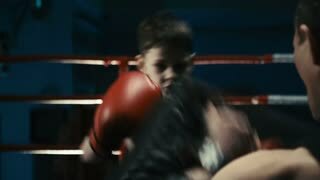 Boy mimics boxing. The boy has a good mood. Lawn of dotted with yellow flowers. Evening spring day in the forest. The sun hid behind the clouds. 1950s: Boy walking with cane, girl looking into mirror, boy boxing. Firecracker spinning. Close up of teen boy. A coach in a blue sweatshirt trains two boys. Sports children, training in boxing. Special boxing exercises in the winter. The boy jumps on the rope. A fight with a shadow. 1950s: Boy walking with cane, arm in sling. Boy with cane, girl with mirror, boy boxing. A coach in a blue sweatshirt trains boys. training in boxing. Special boxing exercises in the winter. A fight with a shadow. Little blonde boy boxing, playing with the man in the park. The boy is engaged in boxing. In the foreground there are hands in black and white gloves, the boy's face is blurry. A boxer in a gray sports shirt stands on a dark background. Sports children, training in boxing. Special boxing exercises in the winter. The boy jumps on the rope. A fight with a shadow. Man Training With a Boy a Boxing Lesson. Silhouettes. Orenburg, Russia - 23 January 2016: Boys compete in boxing.